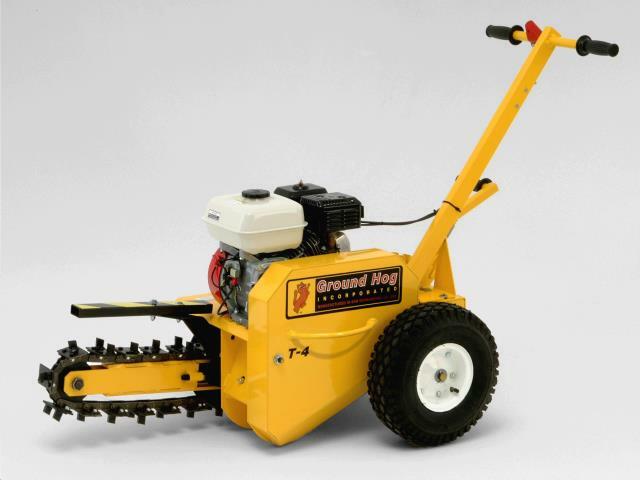 The Ground Hog T-4 Trencher is a small, operator propelled, chain-type trencher designed for jobs requiring up to a 12 inch deep trench. Heavy gauge powder coated steel is used throughout the T-4's construction as well as tapered roller bearings and double-row ball bearings to ensure trouble-free service. Over 60 years of experience in the Rental, Construction and Landscape industries has produced a design that is very durable and easy to maintain, which leads to a fast return on investment. The T-4 s narrow, compact design allows easy access around the job site and it easily fits through gates and doorways. The T-4 is also easier to use and transport than larger trenchers. The simplified operator controls help make the machine less intimidating to operators unfamiliar with using outdoor power equipment. The Ground Hog T-4 uses a unique ratchet mechanism on the wheels to help prevent the machine from pulling away from the trenching direction. This greatly aids the operator while trenching and allows the trencher to do the digging while the side delivery auger piles the dirt up neatly beside the trench. When the depth control handle is moved to one of the 3 digging positions the wheel ratchets engage allowing the wheels to only roll in the trenching direction. The T-4 is available in several different configurations in regards to the maximum depth of the trench, the blade type and choice of engine. Two different maximum trench depths are available, one that has a maximum depth of 12 inches and one that will dig up to an 18 inch deep trench. Both models have 3 operator controlled depth settings and are essentially the same machine with the 18 inch model having a longer digging boom and chain. 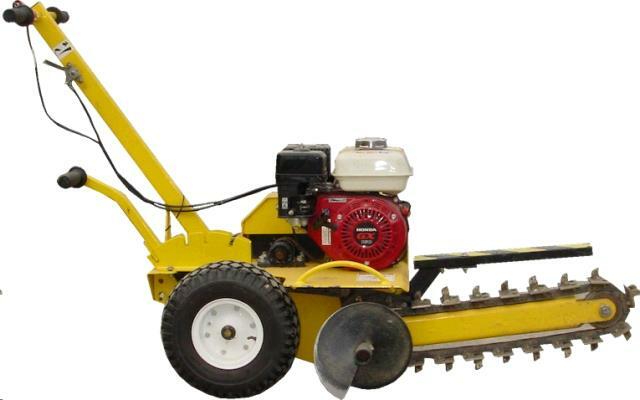 Both the 12 and 18 inch models are available with a choice of replaceable carbide-tipped Shark teeth or replaceable carbide-tipped Bullet-type teeth for digging in all types of soil conditions. The compact size of the T-4 Trencher and it s built in lift handles make it easy to transport. The unit easily fits in the bed of a small pickup truck and we offer an optional carrier so the trencher can be easily loaded and unloaded by one person and securely transported on the back of any vehicle with a Class 3 or better hitch receiver such as an SUV or van. * Please call us for any questions on our mini trencher 3 inch x 12 inch rentals in Santa Ana and Orange CA.